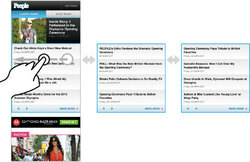 People Magazine launched a new mobile site last week, the first responsive website from Time Inc.’s 95 magazine titles. Check it out at m.people.com. I had the good fortune to lead the design effort and pull together some of the finest web talent on the planet (and also some of my favorite people). Josh Clark led the project as creative director and interaction designer. Ethan Marcotte wove the remarkable markup (remarkup?). Jenny Ng dazzled with the visual design. 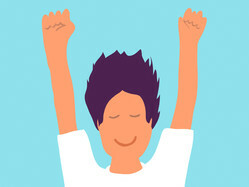 Karen McGrane crafted content strategy. Jonathan Stark coded the photo gallery into submission. Travis Harwood wired up the information architecture. The whole thing happened under the pragmatic (and genuinely gymnastic) direction of Time Inc.’s Tony Brancato, a great partner for us. And man, did we ever need the enormous brains of all these talented folks. Bringing a site as vast as People’s to the small screen conjures a slew of challenges and opportunities. We developed some novel approaches that I want to share here. I’ll cover the site’s approaches to advertising, progressive enhancement, navigation, web interactions, full content across devices, and cross-screen community. First, though, here’s what we set out to do. 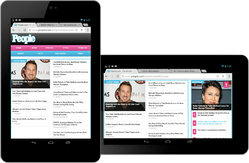 Our brief was to design a responsive site for phones and 7” tablets (Kindle Fire, Nexus 7, etc.). People has two other sites: one for desktop and one for iPad. The new edition stakes out the smaller end of the spectrum, replacing a very simple site that has served phones for several years. 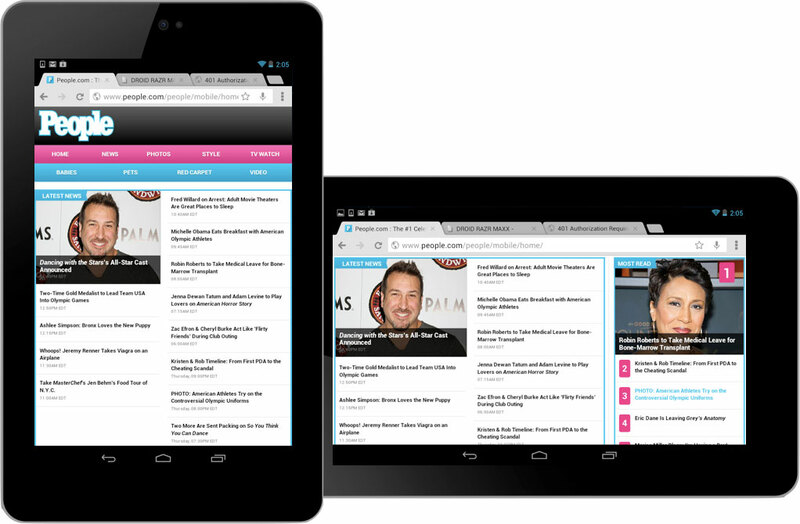 The new site’s responsive web design adapts to three primary breakpoints: the phone, 7” portrait, and 7” landscape. The irony for this “small-screen” website is that its 7” landscape layout is nearly as wide as People’s desktop design. In creating this small-screen design, in other words, we also created a desktop-sized design, too. This is the essential nature of responsive design, of course, a layout that adapts gracefully to a wide range of screen sizes. One of Three… For Now? So why maintain three separate websites? Why not have a single responsive site and be done with it? I’m on record with a strong point of view that everyone should strive to have a single website that feeds the same content to all devices. That’s the ideal, at least, and I believe it should be the default starting point for any web project. Always ask, “Can we do this with a single site for all devices?” And if you can, you probably should. But pragmatism is required here, and business realities leave little room for dogma. There are a whole slew of potential reasons why it can be tough to blow up your existing sites and replace them with a single responsive site—business reasons, technical reasons, organizational/political reasons, or simple risk management. Sometimes change can’t happen all at once. But you can still get there one step at a time. People’s approach is a sensible one: build a mobile site using responsive techniques as a first step. Over time, you can overcome business/tech/org challenges to let your responsive mobile site grow up and eat the other sites. I don’t speak for People, and I don’t know if that’s their plan. But I hope so. This new site positions People to move eventually to a single responsive site, which would simplify their tech maintenance and editorial workflow. Word is, this new site will eat the iPad site next. For now, though, this is a sturdy first step in the march to the promised land. You can’t always make the whole journey in a single leap, but you can still make steady progress toward the ideal. Eyes on the prize, friends. “The initial version was us operating on the assumption that people were coming to the mobile phone to snack.” But when 25 percent of mobile users spend 5 minutes or more on the site, they’re coming for more than a quick snack. Our job was to figure out how to wedge People’s vast store of content into the small screen without overwhelming readers. Here’s how we did it. 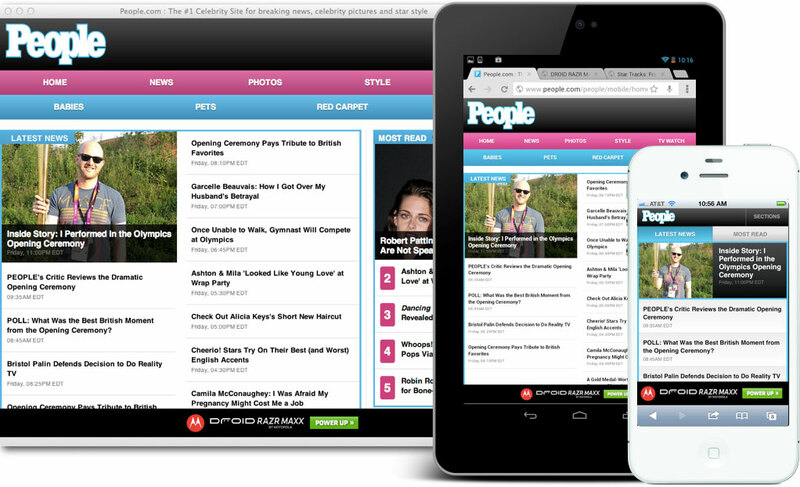 People.com offers a fast-flowing stream of daily content. The homepage’s job is to surface a ton of that content for quick, frequent scans of headlines and photos. On larger screens, we do that by displaying lots of links for the key sections, in typical news-website style. We show two columns for portrait and three for landscape. Portrait and landscape views on the Nexus 7 tablet. Shrink the screen, though, and that giant collection of links suddenly becomes unwieldy. If you squeeze those links into a single column, you get an endless list of links, which is swipe-swipe-swipe frankly awful swipe-swipe if you just want a swipe-swipe-swipe summary of the swipe-swipe top news. This is a common problem for mobile sites, and that’s where progressive disclosure is such a successful technique for small-screen interfaces. Progressive disclosure is a high-falutin’ term for showing only essential or summary information but making it dead easy to drill down into secondary screens or content panels when you want more. On the homepage, we deployed carousels to do that work for phones. At the smallest breakpoint, the two or three columns of links collapse into a three-panel carousel. Only one panel of the carousel is visible at any moment, of course, so the initial display shows only the first one-third of links for each section. This approach lets you scan the latest headlines in every section with a quick vertical scroll, but you have the option to drill into a section’s secondary headlines by swiping horizontally through the carousel, or by using the arrow navigation. We’ve been trained to believe that extra taps, clicks, or swipes or evil, and that’s not true. As long as every tap provides satisfaction (a completed task, more information, a smile), then it’s a quality tap. If the information scent is strong and if every tap is a quality tap, then it’s appropriate to require extra taps in the service of clarity on individual screens. Quality taps are more important than their quantity. This is true in all interfaces, but especially for mobile: Clarity trumps density. If you’re a web developer, you’re already familiar with progressive enhancement, where you gradually layer new functionality into a site according to the capabilities of the browser or device. Aggressive enhancement goes further, treating content itself as an enhancement. 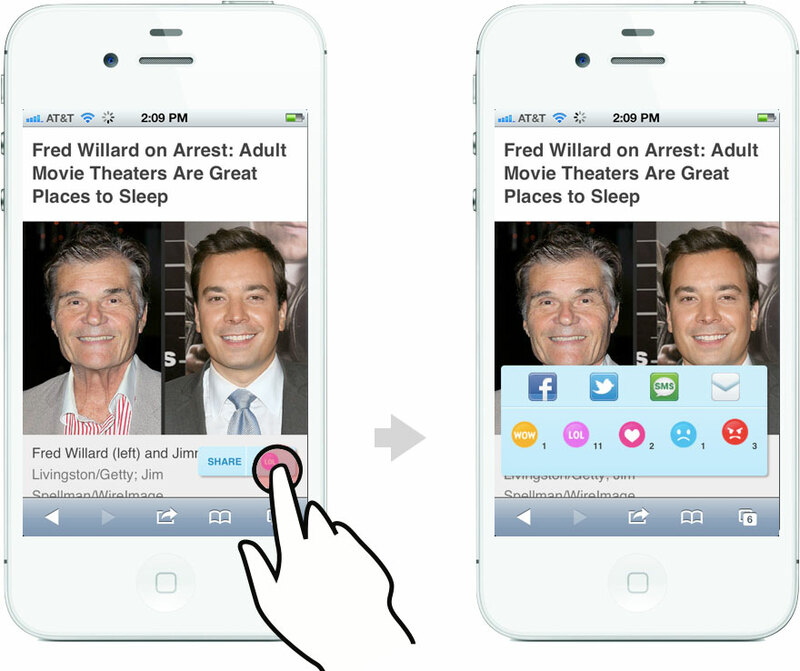 Know how Readability and Instapaper whittle a page down to its basic content? That’s what we did by design. Aggressive enhancement delivers a page containing only the most fundamental content, then fills in secondary content via Ajax. This approach works well for sidebars, “about us content,” some forms of secondary navigation—and in the case of the People website, the carousel content. We also took extreme care (and a lot of lumps) to make the photo galleries accessible to all devices. Visit the gallery on a capable touch-enabled device, and you get a solid, fast, silky experience as you swipe through the entire photo gallery within a single page. The gallery is a full-screen experience, and you can tap to toggle the navigation controls, view photo captions, and reveal sharing options. The swiping photo galleries degrade elegantly for less capable browsers. 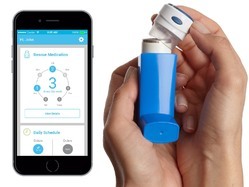 Why go through all this trouble to support underpowered devices? Many are older devices due to go out of rotation, right? First, supporting the largest possible audience is just plain good business sense. Doing otherwise leaves money on the table. More important, though, it’s a future-friendly strategy. Aggressive enhancement emphasizes essential content in the way it delivers pages over the wire. The same content-first values should apply to the design, too. 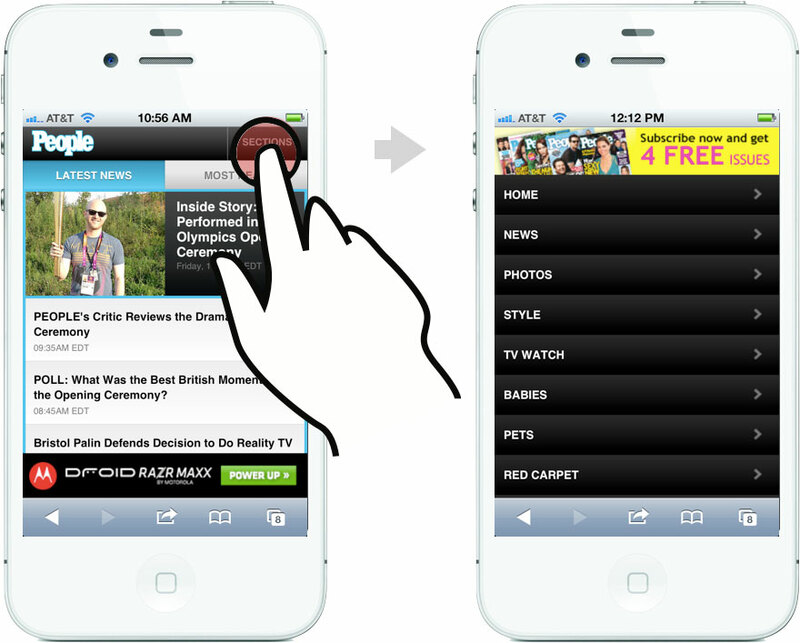 Mobile web experiences should lead with content, not a big stack of navigation controls. With time and screen real estate at a premium, mobile designs should fill the first screen of every page with the good stuff, with content. At People.com, screen navigation is tucked behind a Sections button in the top toolbar. Tap the button and the entire screen fills instantly with navigation options. The menu’s appearance is instant and feels like an overlay has appeared, but in reality, it’s actually an anchor link to navigation at the bottom of the page. In larger layouts, we fall back to traditional desktop conventions and shift the navigation to a horizontal strip at the top of the page. Delivering effective ads on mobile is just plain hard, and I’m not convinced that display ads will pan out as the future of mobile sponsorship.2 For the moment, though, banners remain at the center of things. Display ads are the revenue model, and publishers and advertisers are trying hard to find a way to make them work. It’s an uphill climb. 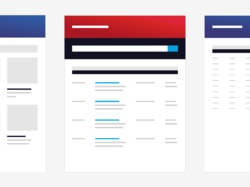 Traditional expectations continue to apply: advertisers want “above the fold” banner ads, but those usually choke out content or flick by so fast you don’t see them. Both the advertiser and the reader are poorly served. I came up with a new ad format to try to address this. Snap banners hug the bottom of the screen in a fixed position but, as you scroll, they find a home and snap into a scrolling position on the page, eventually scrolling away like any other content.3 This new format stays on screen longer than a traditional inline ad, and the banner’s sudden leap into the scrolling page catches the eye, too. Those elements work to advertisers’ advantage. But the snap banner also stays out of readers’ way at screen bottom and then eventually gets clear of the screen entirely, both to readers’ advantage. Snap banners stay fixed at page bottom (left) but eventually snap into place in the page to scroll freely (middle). Tap the image to see it expand to full screen (right). Even with the snap banner, though, tiny 320x50 mobile ads don’t carry much visual oomph. So we experimented with ads that expand to full screen. In addition to the snap banner delivery slot, we delivered responsive snap-banner templates that expand to full-screen on any device when you tap them, without taking you off the site. Tap again to dismiss. We also serve occasional full-screen ads as interstitials in the photo galleries. In past user testing, I’ve seen high acceptance of ads in that context. Since you’re in gallery-flipping mode, it’s no problem to keep on trucking past the ad to the next slide. It’s like flipping through a paper magazine, but the format is bold enough that a reader will pause if interested. 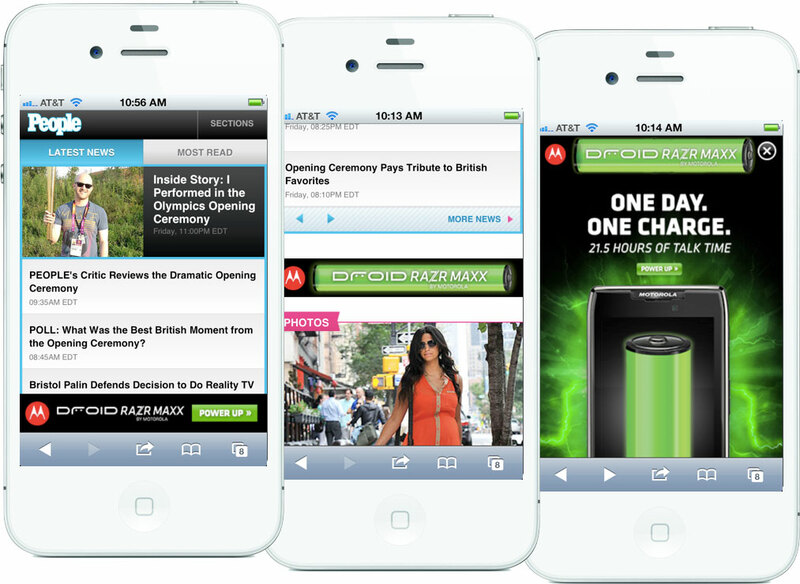 Aside from interaction challenges, ads remain a real challenge for responsive layouts. Most ads are still delivered as blocks of immovable pixels packed into into files with names ending in gif or png. Typically, you get one size of creative and that size is almost certainly defined by IAB standards. We delivered some responsive, cross-platform ad templates as part of the design, and we’re hopeful that they yield useful discussions between People and its advertisers. This is a tough chicken-and-egg problem. Even with 1 billion page views a month (a billion! ), People.com doesn’t have the individual weight to swing industry-wide change on ad formats. Unfortunately, agencies and networks show little interest in doing this on their own, despite the advantages. Someone has to budge. The best we can do is be noisy in our advocacy and generous with our examples. Meanwhile, we have to work around these inflexible ad units. 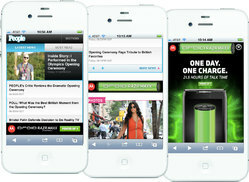 Typical banner ads jam the machinery of a responsive design. Responsive design relies on flexible elements: images, text, and other design elements that shrink and expand with the layout. Ads are rarely flexible. Shrink them down, and the text becomes unreadable. They are nearly always intended to be displayed at one size and one size only. For now, that means ad-driven responsive designs have to build themselves around these immovable building blocks. When you build to IAB standard sizes, for example, the design favors the 320x240 ad block, since that’s the largest size that will squeeze inside most phone screens. In larger layouts, column widths are set to accommodate that same ad block. You see this in The Boston Globe’s design, and we did the same thing. It’s not just a technical issue. It’s also a sales issue. “Separate creative for separate devices” is a reflection of the way these ads are sold. Mobile, tablet, and desktop versions of websites are presented as completely separate properties instead of simply “the website.” Trouble is, it’s people who form market segments, not devices. Segmenting by device—whether that’s for content or for advertising—just doesn’t reflect the way we consume information today. Providing space for ads needs to be broadened into multiple spaces for one ad concept. This requires closer collaboration between advertisers and web sites, designers and marketeers and sales teams. We’re still learning how to do all this stuff, and ad experimentation is needed on technical, business, and cultural fronts. Photos are core content for People, and it was a real challenge to improve the presentation of photos—really feature them—while also remaining lean for mobile performance and compact for mobile display. That decision was due to the nature of the source images available to us. People’s digital team does a ton of work with the photos, manually cropping and sizing each and every image that comes through. 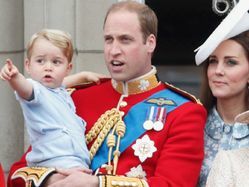 They typically generate over ten different versions of every photo. It’s a tremendous workflow. People selected their cut sizes based on the needs of the desktop web layout, which is sensible since that’s almost exclusively where they’ve been displayed so far. But here’s the thing: those desktop-sized photos are too small for mobile—or at least, for retina-display screens. 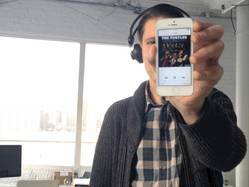 You read that right: too small for mobile. Most photos on the desktop site max out at 435x580, smaller than the iPhone’s 640x960 screen, for example. (A jumbo photo size for iPad is also available for some photos, but not all.) Since we rarely had a high-resolution image available in the first place, we didn’t have to cope with the responsive-image issue, a mixed blessing. Unfortunately, that meant we weren’t able to serve People’s remarkable archive of photos in the best light for the growing population of high-res screens. Another goal of the site was to knit together community on all platforms. People uses Disqus as its comment platform, so we wrestled their API into the new site’s design. But we also introduced a new element to the People ecosystem. I call them emoticomments. Emoticomments are one-tap microcomments: they’re multiple-choice “Like” buttons, with emoticons as your options. They’re available on any photo or article, on all platforms. They’re a playful, effortless way for readers to share their reactions. Jenny Ng designed simple emoticomment icons to capture five essential emotional responses to People’s editorial. People’s design crew replaced these with their own to make them consistent with the icons used on the desktop site. Responsive web design is only a little over two years old. We’ve come a long way in that time, and every launch of a responsive design for a giant content site like this one is a marker of just how far. Responsive design is elegant and even simple in its theory, but sometimes devilishly complex in its details. Ethan has been barnstorming the country this year, sharing his techniques for overcoming some of the bumps and headaches that are inevitable with any new technique. We’re making headway. I’ve shared a few of our strategies for managing those bumps here, and all of it continues to evolve. In any fresh technology or technique, the initial challenge is simply, “can we make this thing work?” Once you do, it’s time to add the polish. That’s the stage we’re at with responsive web design. As an industry, we’re moving at remarkable speed to improve the experience now that we’ve built the machinery. That’s happening not only in geeky areas of performance and optimization, but also in content strategy, workflow, and business strategy. I’m crazy proud of our team for some of the new techniques that bring that polish to People’s new site. Lots more great stuff ahead. Big Medium crafted a design system to help one of the world’s biggest companies scale great design across hundreds of apps. 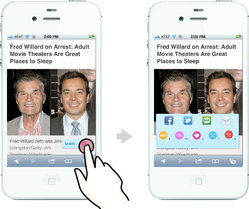 Happy Together is a prototype app that lets you transfer data or media by shaking it out of your phone. We crafted a new website—and along the way, a new brand—for the world’s most iconic publisher. Here’s how we did it.